The days leading up to and following Labor Day Weekend are some of the biggest car shopping days of the year. Across the United States, four million auto shoppers say they plan to buy or are considering the purchase of a car, truck or SUV at a dealer’s sales event. One out of three plan to make that purchase during the late August to mid September dates. So at Melloy Dodge in Albuquerque, we gear up for these days, knowing our customers expect extra sales incentives, and an easy purchase process. 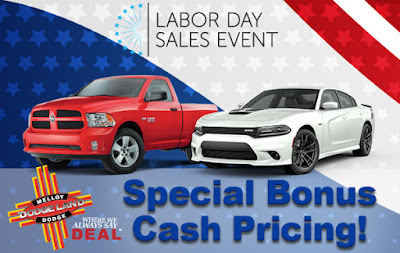 The manufacturer of Dodge and Ram vehicles has announced extra rebates for these days to maximize your savings with Special Bonus Cash Pricing! The Melloy Dodge Sales Department will be open from 8am to 8pm, Monday-Saturday; 11am to 5pm on Sunday, Sept. 2; and 10am to 6pm on Monday, Sept. 3. We’ve recently updated our website so that you may email directly (Get Your E-Price) from the listing page for all Ram 1500 trucks, for example, not just from a specific truck’s detailed listing page. It’s also easy to find your credit score (which will not impact your credit) from our website, and to get pre-approval for an auto loan. Buyers today can literally complete the purchase of a vehicle without coming to the dealership except for the test drive, financing paperwork, and delivery. If you clicked on a digital ad for a specific model to arrive at the website, you’ll see any monthly incentives for that model in a graphic at the top of the page. With about 80 percent of all of our website traffic now coming from mobile devices, the MelloyDodge.com website is very mobile friendly! The Melloy Dodge sales department will be open from 8am to 8pm during the weekdays around Labor Day Weekend, with additional staff to answer your questions. Our internet team, often the first contact for customers who call or email us, is staffed with experienced automotive salespeople who can answer questions about the extra incentives, financing, or trade in value on your vehicle. Melloy Dodge is New Mexico’s #1 selling Dodge and Ram dealer, recognized for multiple years with the Customer First award from Fiat Chrysler Automotive. Visit our dealership at 9621 Coors Blvd NW in Albuquerque, north of Paseo del Norte near the Cottonwood Mall, or call us at 505-843-9600.